On the 25 April 2015, just before noon, my sister and I were walking by the lake in Khahare, Pokhara in Nepal when the most unpredictable thing happen. Suddenly, the earth beneath our feet started to vibrate and we could hear voices of people shouting and screaming. The ground shook up and down. We held on to each other not knowing what was happening. My sister and I were travelling in Nepal when the magnitude 7.9 earthquake struck. It killed and injured thousands, leaving thousands without shelters and food. We experienced many aftershocks since the first hit. We were stranded in Pokhara as it was a national emergency. There was no mode of transport internally and externally. We were contacted by British Embassy as family members got worried about our wellbeing. Both British and Malaysian embassies advised us to stay safe and calm till situation in Kathmandu settles down. Kathmandu had experienced severe destruction due to its high density. 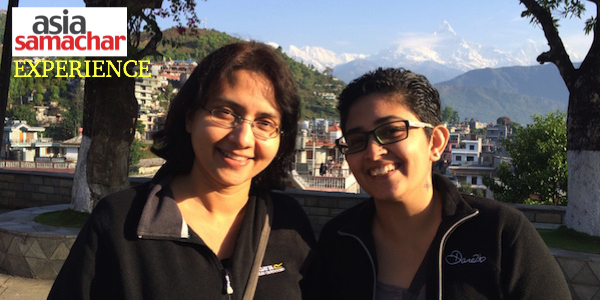 Jagdeep Kaur (left) and sister Daljeet Mann were stranded in Nepal. They decided to make themselves useful. In Pokhara, we offered some dasvandh (contribution) that some of our close friends and family offered to help the people in need especially in the epicentre Lamjung, surrounding areas of Langtang and Gurkha. We worked hand in hand with the local TAAN (Trekking Agencies Association of Nepal) vice president Deepak Raj Adhikari by getting tarpaulins and mats for shelter. We gathered other contributions from locals such as food goods and hygiene necessities. We offered our help with Guru’s kirpa and guidance. We made our way to Kathmandu on the 29 April as fights starting commencing as scheduled but were running late as the airport runway was used for relief flights to land. We arrived at the Gurdwara Guru Nanak Satsang Kuponadola Lalitpur in Nepal at night. The gurdwara building was safe but there were damages noted at the entrance gate wall and the small domes of the Deori. The gurdwara started langar seva [free community kitchen] continuously for anyone who wished to have a meal. 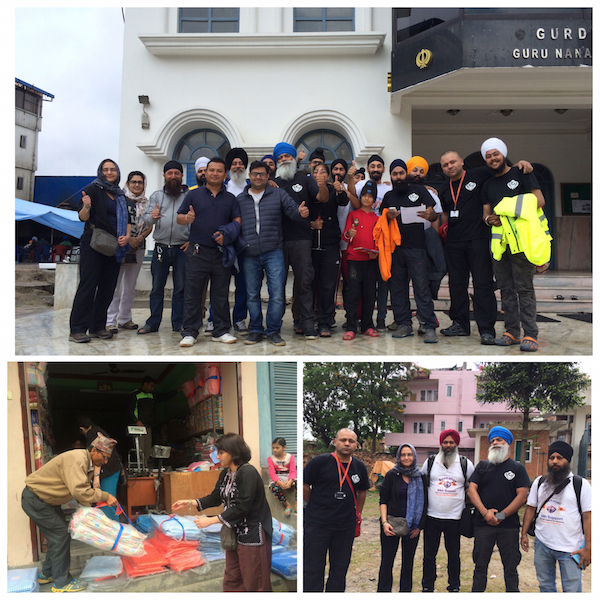 The sanggat (congregation) was reaching out to people in need by helping the Sikh relief organisations that arrived in Nepal. SISTERS IN NEPAL: (Top) Group photo with the Khalsa Aid team in Nepal. BOTTOM, LEFT: Jagdeep sorting out basic essential items like tarpaulin and soap. BOTTOM, RIGHT: With Khalsa Aid point person Ravi Singh (second from right) and other volunteers from the UK-based team and the Australia Sikh Support members. The gurdwara grounds became shelter for the homeless from the surrounding area and the scared local sanggat. A truck full came from Birjung local Sikh sangat to help out the people of Kathmandu. The local sangat prepared beaten rice packs, a common food for the Nepalese, for distribution. We had a chance to met Khalsa Aid CEO Ravi Singh. Khalsa Aid’s initial team arrived in Nepal on 26 April to assess the severity of the situation and with medical supplies. On 29 April, Ravi Singh and Ravi Singh Gill from the UK arrived. Khalsa Aid is an international humanitarian relief organisation set up in 1999. The dasvandh that is offered to Khalsa Aid is to help many who are suffering from natural disaster, conflicts and poverty all over the world. Khalsa Aid has set up their base in Nepal and will work to restore as much as they can in the next 6-8 weeks. It was an experience of a life time that won’t be erased easily as it has an impact on our lives personally.